Last month, in a span of one week, I saw a children’s theater show, a high school play and an evening of theater by my peers. I had an equally great time at all three. I never felt so inspired, invigorated and proud. 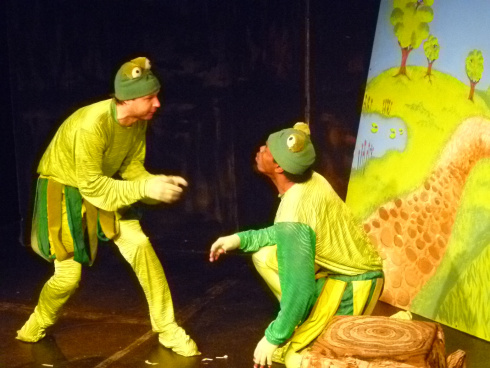 The first was the LA Children’s Theater production of The Frog Prince directed by an actor friend of mine and included my actor boyfriend in the cast. Though I was not of the audience mean age of 5, I thoroughly enjoyed this colorful, musical production. It excited me so much (here comes the nerdy theater geek in me) to see a fresh crop of potentially theater-going, theater-loving and perhaps theater-performing people! To watch these little kids take delight in a story unfolding before their eyes was as entertaining as the play itself. (It reminded me when I was first captivated by the magic of theater when I went for my 5th birthday party to the Santa Monica Playhouse production of Cinderella) They loved set, the costumes, the music, the characters and the audience involvement. At certain points throughout the play, the kids were invited to be a part of the story. This kind of audience participation, I believe, should not be limited to children’s theater. Everyone likes to feel included, at 5 or 55. It’s something my theater company PianoFight values and includes in practically every show they produce. Anyway, I saw the show twice- opening and closing and both times I had a blast. The second was Viewpoint School‘s high school production of The Cherry Orchard directed by my high school theater teacher and now colleague. Watching teens perform at the school and at the age when I truly fell in love with theater was sort of… nostalgic. And watching them perform on a state of the art stage with a professional set and costumes was sort of… bitter sweet. I did not have those things when I was there, nor will I perform on a stage like that for a long time. I tell my high school students all the time to appreciate what they’ve got now because after school it will be a while before they’ll ever experience that level of production again… unless they go straight to Broadway. But whether or not they realize that or whether or not they’ll ever act again, it was so exciting to see young people, who have their whole lives ahead of them filled with infinite possibilities, perform. That amidst SATs and APs, and despite the inevitable judgement of select high school jocks and what nots, they’ve chosen to spend their precious after school hours, free periods and weekends to study Chekhov, memorize lines and act! The third was a collection of original one acts produced and acted by fellow actors who were in the Atlantic Theater program at NYU with me (but actually stuck it through). The inaugural class of the Atlantic LA program formed a production company, Acorn Pictures, upon graduation and though their primary focus is film, once a year “unplug” for an evening of live theater. Again, I sat, excited, in anticipation of experiencing the original writing, directing and performances of my peers. Some of the people involved were in the same group as me my very first year at NYU and in the past couple of years have reconnected and been involved with my own productions. Against the so-called odds and despite the millions of people who have moved to LA to “make it” they’re out there creating their own stuff and rightfully showing it off. This excites me to no end. Because, for one, it’s aways exciting watching people go after what they love and two, it means I can do it too. This is possible. We are all out there doing it and one day one of us is going to make it and that means we all did.